Daily Post, Wales editor Alison Gow examined the evolving role of the editor and the competencies required to face the challenges of operating in an increasing complex and competitive media. Dilyan Damyanov, director of information services at Aii Data Processing in Bulgaria , investigated a slew of new ways that publishers could sell their content. Aware that the intention to innovate is no guarantee of success , Times Media Group’s head of journalism training Paddi Clay paused to critically reflect on a specific case when newsroom innovation didn’t deliver. Steve Matthewson managing editor: news at Business Day and BDlive, explored the social media strategies and practices at two UK newspapers with significant global reach, The Guardian and The Financial Times. Laurice Taitz-Buntman, the director of In Your Pocket City Guides, South Africa, considered the challenges top executives face in fostering an innovation culture within their organisations. 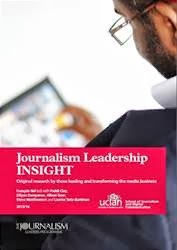 All five executives who contributed to this report set out to further equip themselves for the challenge of driving change by enrolling in the pioneering Journalism Leadership Programme at UCLan. These articles are drawn from their final dissertations for the MA in Journalism Leadership which were supervised by François Nel and Mac McCarthy with additional support from Megan Knight and George Ogola. Journalism Leadership Insight is free to download and collaborators on future reports are invited. Leadership training teaches leaders to communicate better with their team. Untrained leaders may expect their team members to think and act just like the leaders themselves do, which is not possible. WANT TO KNOW WHAT INNOVATING MEDIA COMPANIES ARE PLANNING NEXT? Get your summary of the 4th annual study - and the full 2014 report by participating in the current survey NOW. Want to know how British newspapers have tackled challenges to their traditional business models? See 'Pressed to Change: Business model innovation and integration in the British local newspaper industry', a report by François Nel commissioned by NEMODE, an initiative under the Research Councils UK Digital Economy programme. The report includes case studies drawn from amongst the sector’s largest companies, Johnston Press and Trinity Mirror, a can be downloaded here. Laid Off: What do UK journalists do next? Less than a quarter of study respondents had found full-time work. Of those, only 18% were back at a newspaper, while the same number had moved into PR or marketing. A similar number - 20%- had moved into other positions, including working as a dentist's receptionist, a market trader and running a coffee shop. you can download a copy of the full #laidoff report by François Nel, in collaboration with Journalism.co.uk, here.